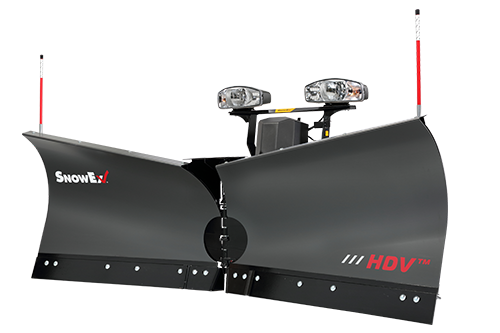 Increase productivity, stack snow higher and pierce through hardened, wet snow that has frozen with the SnowEx® HDV™ heavy duty V-plow. The hinge in the middle of the moldboard allows the blade to adjust to V, straight or scoop, giving it the ability to angle and better direct the snow. Featuring the Automatixx® attachment system, the SnowEx HDV V-plow is available in durable powder coated mild steel or rust resistant stainless steel and fits on most ¾ ton and 1 ton pickup trucks. The HDV is perfect for contractors maneuvering through tight spaces or experiencing heavy, drifting snow in Fargo. Add the Scrape Maxx™ down force kit accessory for increased back dragging performance.